Most people recognize blue morpho butterflies due to their large size and iridescent blue upper wings. While blue morphos in their fully mature form are known for being some of the most fantastic-looking butterflies in the world, their caterpillars are often underrated, for they too possess a highly striking appearance. 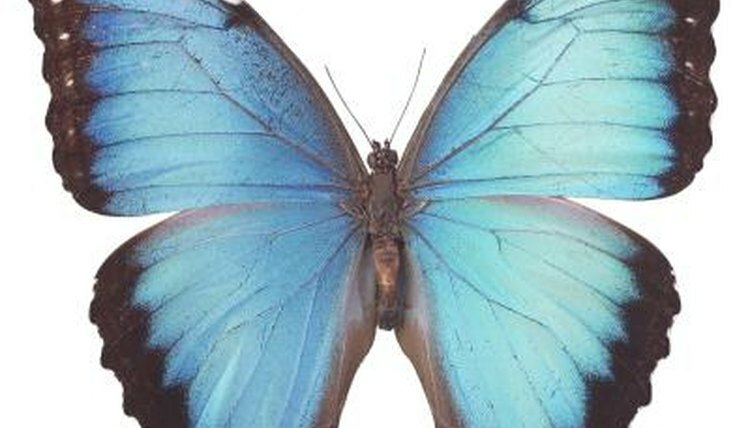 The blue morpho butterfly actually isn’t a single type, but rather a collection of blue butterfly species. They are insects belonging to the order Lepidoptera, along with all moths and butterflies, and the family Morphoidae. They only live for about 115 days, during which they spend most of their time eating, metamorphosizing and mating. Though blue morphos typically prefer lower-lying trees and shrubs, they will fly great distances to find a suitable mate. Blue morpho caterpillars have a reddish-brown body with patterned patches of other colors. Usually these patches are bright lime green and diamond-shaped, though they may also be more muted grey or yellow colors. These earth-toned hues are echoed in the coloration of the underside of the adult’s wing. Unlike some caterpillars, blue morphos do not have obvious heads of a different color. As a protective mechanism, their bodies are covered with hair that can be irritating to human skin. The genus morpho encompasses more than 50 species of brilliantly colored blue butterflies, which exhibit variations in wing color and pattern that distinguish one from the next. All possess a blue coloration that can turn opalescent or violet when seen from the right angle, along with black antennae and faint black lines within the wing structure. Some species have white spots on the black portions of the wing. When wings are closed, the butterfly looks more like a moth, with brown and gray coloration and large eye patterns on the underside of its wings. Blue morphos are found in the tropical rainforests of Central and South America, usually within the canopy but often also in clearings. They are unusual in that they can engage in “crypsis,” a capability where they sleep at night with wings folded rather than extended, making them virtually invisible. While adults feed on fruit, larval caterpillars are highly cannibalistic and often feed on each other, a phenomenon attributed to the fact that they possess few natural predators. They do also eat leaves, however.